Photos from Dutch suburban areas and countryside by Marven Norman. This is the second in a two-post series about Dutch suburbs. It’s understandable why vehicular cycling techniques thrive in suburban America. In the absence of good bike infrastructure, taking the middle of the travel lane really is the safest way to ride — uncomfortable though that is for many of us. But if American suburbs are ever going to be made truly better for biking, today’s suburban bicycle drivers will need to find common ground with me and my fellow fans of Dutch infrastructure. Here’s what that might look like. I’ve seen it myself numerous times: The bicycle drivers only demand “Bicycles May Use Full Lane” signs and sharrows while shunning anything else exclusively for bikes. 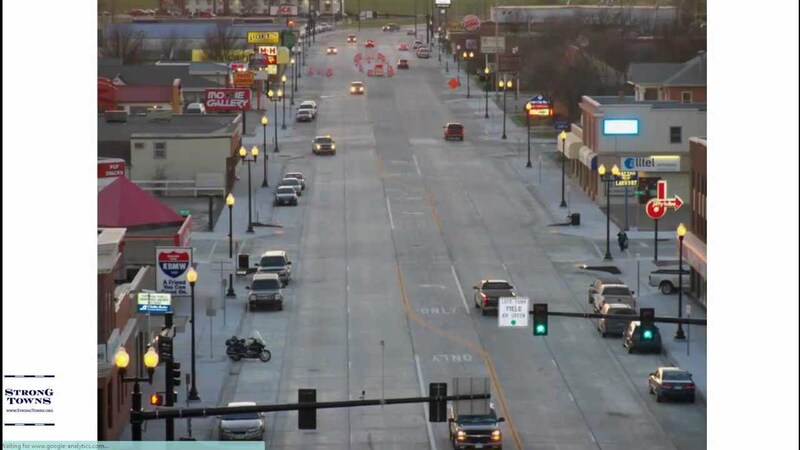 Meanwhile, the planners and engineers are hearing from the rest of society that they want “more bike lanes.” But without any valuable input about design features, they resort to their manuals… and the result is bad infrastructure. It’s long past time for the more experienced riders to adopt an approach of pragmatism. I find those who campaign solely for sharrows and education, or else nothing at all, to be incredibly short-sighted. Approaching the design team that continues to hear “give us bikeways” and telling them not to isn’t a winning strategy, especially when outnumbered. But approaching the same team and saying “let’s make sure that these bikeways are the best possible” will actually produce facilities that do meet the needs of 95 percent of bike users, even those of us who like to travel at a good clip. Good bike infrastructure is designed for speed. It’s unfortunate that many American street designers are afraid of the Dutch CROW manual, which is already a great document for how we could do things. Even if a clueless intern designed something straight out of the book, the results would be palatable for 90 percent of bike users and 95 percent of their needs. The CROW manual goes beyond the standards of the NACTO Urban Bikeway Design Guide and calls for a design speed of 30 kilometers per hour (about 19 mph) for through routes and 40 kph (25 mph) for routes outside of cities or shared with mopeds. Those are roughly equal to the speeds that most bicycle riders would ever expect to reach in a typical journey on those segments, so that’s more than adequate. The reason that most U.S. planners (unfortunately) focus mostly on the short trips at the detriment of speed is because those are the journeys that make up the bulk of all trips. For all the sprawl of America, people don’t go very far at all. According to the data, a staggering 15 percent of driven trips are no more than half a mile, a distance that could be easily walked by most people, to say nothing of biking. Obviously, that represents a huge opportunity on multiple fronts, so it’s no surprise to find that advocates are trying to lure people onto bikes for their short trips. When you look at Dutch data, you see that the lion’s share of Dutch biking occurs up to about two miles, then quickly loses out to cars past that point. In other words, most people in the Netherlands just don’t bike far at all. In fact, data from Portland shows that Americans might actually be willing to bike farther than the Dutch. However, people looking to bike far in the Netherlands are not out of luck, either. They don’t have a fancy name for it, but the Dutch have been building “bicycle superhighways” for years. Stuff like this stretches across the country to connect the villages, towns, and cities. I tend to agree with those who say that the interurban commute trip is one place that American advocates are dropping the ball. At the same time, it’s worth noting that in the Dutch ridership figures, only 16 percent of trips are people riding to work. For all the hype about bike lockers and showers, they’re never going to give most American work commuters a strong enough incentive to bike all the way to work — though better transit systems and bike-share might increase people who use bikes as a first-mile/last-mile solution. That said, I understand why Americans don’t focus on interurban trips as much: return on investment. Though provisions for bikes can ultimately be a money saver for agencies, the concept is still too young here to gain much traction. 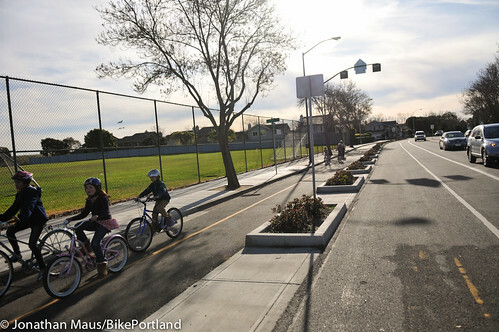 I know that I personally continue to push for bikeways that connect cities and regions, but most advocates are generally working within cities because that’s where it’s easiest to show that people will ride if they have infrastructure. After getting people to bike short trips, those same people will be more inclined to not only ride more and farther, but to also be a more vocal partner in getting more improvements elsewhere, including R4-11s. Biking advocates in the United States are already few enough. We’ll get farther and faster by sticking together. Marven Norman is president of the Inland Empire Bicycling Alliance. He lives in Loma Linda, California. This post was developed from a series of comments he wrote on Streetsblog USA. Agreed. And since this bulb-out would be placed between traffic and the bike lane, it allows pedestrians to wait for crossing about 15 feet further out than they do currently. This not only drastically reduces pedestrian crossing distances (win), but also puts highly visual clusters of pedestrians at the corners, cuing drivers to turn slowly (double win). Raise the crosswalks and intersections as well to force drivers to slow down, and we’ve made huge gains in repairing the urban fabric. I agree that Shared/Multi-use Paths are disasters. I just submitted comments on the inadequacy of 8-foot shared paths to be a major part of a “bikeway network” as called for in a Specific Plan now under review. With that being said, I would say that perhaps the best barometer of the sentiment of many bicycle drivers/vehicular cyclists can be seen in their response to LAB’s decision to not throw their weight behind Cherokee Schill. When Andy Clark said that mixing bikes into highway traffic traveling at 55 MPH or more is an unacceptable solution for the long term, the vehicularists all howled in protest. The sentiment found on several bicycle driving/vehicular cycling groups on Facebook, Google, and other social connectivity outlets was all similar. So while I often hear vehicularists do as you’ve done here and say that they’re not opposed to all infrastructure, their actions don’t agree. I’m not sure I follow. 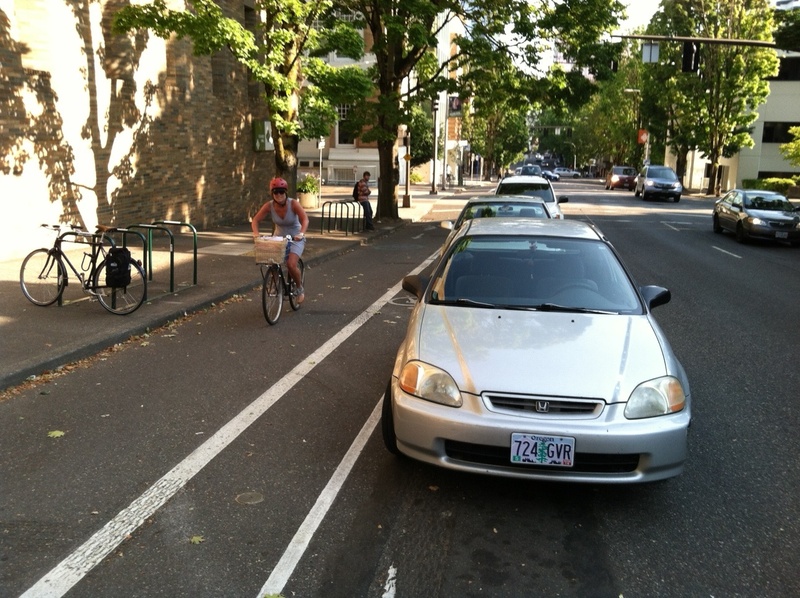 Just because some cyclists don’t want to lose their right to use a lane doesn’t equate to saying no to infrastructure. The Shill story is more about rights than anything – I never had any sense that there was discussion of putting in bike infrastructure there to appease that situation. 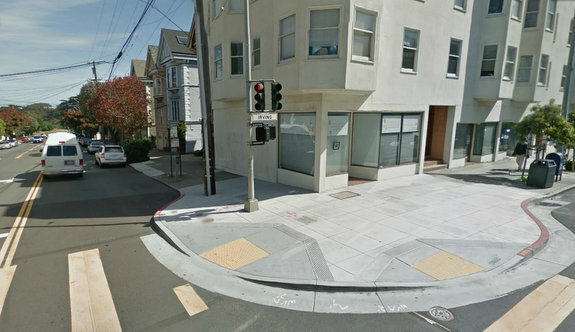 Assuming this is a road with few intersections and high traffic, a sidepath would probably be a great idea for many. I got the sense that this is essentially a highway that just isn’t limited access, so cycling is still legal there even if few want to and few understand why Shill would want to. Intersections are of course critical are there are strategies to improve the (e.g. restricted parking at corners, bulb-outs) sight distances and ensure that riders on a cycletrack are visible. 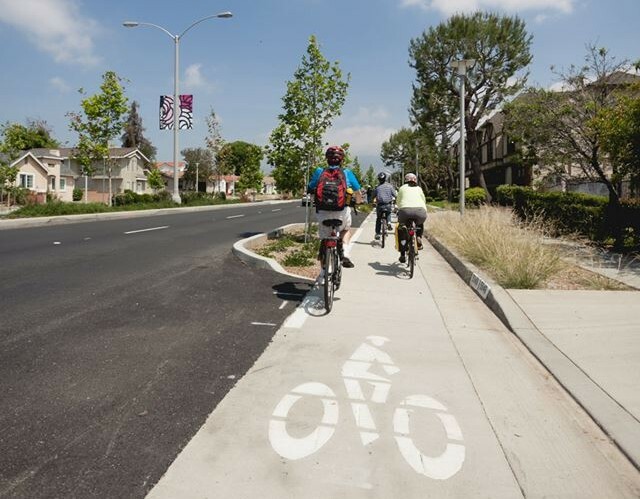 But at the same time, something that has become muddled or has been completely overlooked is that this is part of a series from PFB talking about how protected bikeways suitable for transportation are viable in suburbs or even exurban and rural areas. Many times, we keep hearing that such areas “aren’t dense enough” to need cycletracks. At the same time, suburbs, especially newer ones, are some of the most idealistic places for cycle tracks because the hierarchy of the road network is far purer and clearly divided than in cities. As a result, the roads that would be the ones most needing a cycletrack (arterials, some collectors) generally have strong corridor management including medians, parking restrictions, and few intersections all planned from the beginning. Yet the standard for bikes is still to just apply a strip of paint, which is sometimes even a “generous” eight feet from the curb but usually barely wide enough to properly spell the words “BIKE LANE” (concept in action here at a development in my area that’s still under construction). It’s long past time for that to stop and that’s the primary point of the post. It exists in a lot of places in the US. The Netherlands is a small country–if they can find room, so can we. they’re designed at the turning arc cars should be driving around anyway. Yup! The whole point of this is to incentivize at least some of the 60% + of the Interested But Concerned crowd who won’t bike at all with our current status quo. It sounds like your objections to this kind of treatment are theoretical. Have you experienced this in the Netherlands? People of all ages and abilities use them with no qualms. In the leading picture for this post there’s even a racefietser (“racing-bicyclist”) using a Dutch intersection. Also, remember that *as it stands* you’re already impeded on your right turn when biking vehicularly at such a stop. This is never true with this kind of intersection, where the right is fast, free and easy. Bam. 50% of your turns are all of a sudden much faster and easier than they used to be. If you get a chance to go you should try this stuff it in person–it really does work! (Btw Davis, California is seriously considering building a couple of these within the next year, so that would make it an easier trip for a lot of Americans. As for the money thing, the protected intersections are actually the *cheaper* option as opposed to the other alternatives they’re considering). Well, again, this is where the data shine. The Netherlands has seen a dramatic decline in injuries (once *twice* as high as those in the US) since implementing this kind of infrastructure in the past few decades. Guess whose injury rates are much higher now. As I pointed out earlier, these improvements in safety are not confined to the NL. North American cities as disparate as Long Beach, Montréal, NYC, etc. that have studied before-and-after of protected bike lanes have all noted improvements in safety and modeshare. I’ve ridden in Long Beach and Montreal too. I still don’t care for protected lanes, because after trying them in a few places, I found I was hitting more stops or having to slow down more frequently. You can explain it all you like, I still don’t care for over-complicating an intersection when the issues revolve more around putting cars in places better suited for them, rather than weaving cyclists around instead. This is not mutually exclusive with cycletracks on arterials. Bike Blvds can be great, but I can’t think of anything truly more second-class than insisting people *only* bike there and that they don’t belong elsewhere. Yes, our current state of intersections is subpar. As mentioned in the video. That’s why we’re pushing for better designs where the protection continues into the intersection. It’ll happen (as I mentioned on another post, follow Davis, which appears to be the furthest along in terms of implementing them). In the meantime, while not defending these subpar intersections–it *still* is telling that injury rates go down with PBLs *despite* the subpar intersections. Btw, this was also found in Copenhagen–which also has lots of PBLs but unprotected intersections. The Jensen study there showed that PBLs incentivized an average of 20% more bikes on a given stretch after implementation and a 10% increase in injuries. Doing the math this means a *decrease* in injuries per person per distance traveled. Even with their own subpar intersections. Probably the biggest factor here is the strength in numbers thing. And that’s where insisting on VC Only has never gotten us very far anywhere. While a few of us (including most of us posting here) will, most people just refuse to bike under such conditions. Instead, they drive. Further reinforcing the chance of car-bike conflicts amongst those few who *do* bike, etc. It’s a vicious loop. I must point out that the picture at the top was taken at a roundabout, not signalized intersection. That’s fine, but remember the whole point of this post is the larger macro policy level with more users in mind than the sub-1% of us who will bike regardless. Also, it can’t be said enough–but great post, Marven! Is someone insisting on VC only? For arterials, you seem to be! I’m VC only for highways; how about that? For arterials, I don’t think anyone actually wants to bike there, and so I see little need to build a second system for roads which seem to be currently used only by the most confident of cyclists. 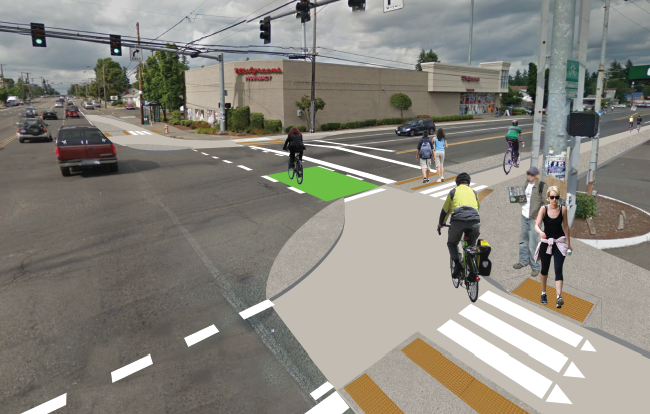 For moderate traffic areas with more frequent intersections, some infrastructure might help the casual cyclist. I probably won’t use it because from past experiences, it wasn’t efficient for me to do so, and it didn’t appear to be any safer for me. If there is a solution that is safe, effective and likely to be used by casual cyclists, then we should build it. For residential streets, Neighborhood Greenways are wonderful because they keep quiet streets quiet, and move much of the remaining car traffic to roads that are better designed for them. –> 50% decrease in the number of vehicle related accidents…from just under 100/year to just under 50/year. Or remember the NYC studies I showed with similar results post-implementation. Again, these treatments aren’t perfect, but they’re yielding results. Whether in dense NYC or 3,000 miles away in sunny Southern California. Indeed! But they cannot be the only solution. *That’s* actual second-class segregation. Which is precisely my point. If there ever was a clear opportunity for a good protected bikeway, that was one. LAB didn’t exactly articulate it that way, but that’s the sentiment I understood from their statement. Yet, the only suggestions I heard from vehicularists was for the same tired list: education for the LEOs/motorists and BMUFL (R4-11) signs to be installed. No on suggested anything else in what is obviously a prime example of where a well-designed protected bikeway would definitely offer a better option to cyclists in the area. From that discussion as well as numerous others that occur on other forums, it becomes apparent that vehicularists are almost always anti-infrastructure of any sort, with several individuals in particular being famous for bullying anyone who ever brings up the possibility of infrastructure. Though I’d like to add at least 5 MPH to all minimums to prevent cluelessness from leading to a badly designed facility, the Dutch standards really are already enough for the majority of applications. Most people don’t ride that fast at all and might barely even be able to sprint at those speeds. All of this is almost completely irrelevant on suburban arterials where there is plenty of space and they are already designed for easily triple that speed anyway, so there’s little reason for an adjacent bikeway to not have a high design speed as well. Again, Bike Blvds can be great, but they cannot be the only strategy. Specifically designing arterials (where many people may live/work/play/etc.) *not* for bikes is actual second-class segregation. The low-hanging fruit for converting car trips to bike trips are those 65% of trips Americans make under mile *in a car*. Those are often all those little things…going to the bank, dropping off a letter, getting a coffee. 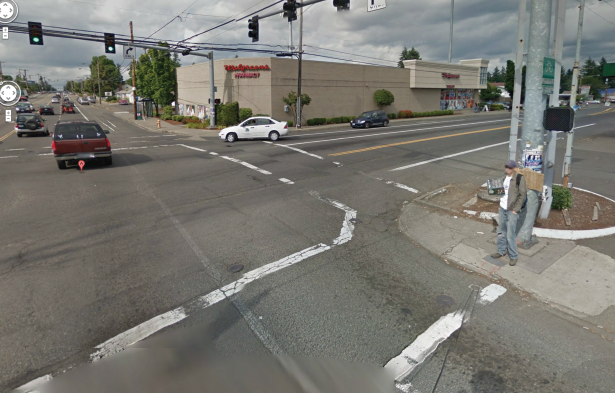 These kinds of things are exactly the kinds of things that are often on arterials. When they look like this, some people switch! Complete Streets infrastructure gives people the choice to use whichever mode they feel like. If they still want/need to drive, fine. But giving people sensible options for alternate modes if they so choose is what it’s all about. Ok, you fix the arterials where you think infrastructure matters, and I’ll fix the residential streets where kids can ride bikes and play again. These aren’t mutually exclusive. But oh how important they can be! Just as drivers will gladly go out of their way for the ease and convenience of a freeway (also in the extreme numerical minority of overall streets for cars), so do the data show many people on bikes will do the same with good cycletrack networks that connect. Try it and you could share it with someone in financial need also! Yea I know, but I also know that would cause a distraction, so I’m pointing it out. As for the post, thanks, and same to you! Yours was at least as good if not better. No visual narrowing + endless horizon ahead = speeding and entitlement on the part of drivers. Even though I *know* I’m in the right and I’ll bike regardless it’s not pleasant. No wonder the Interested But Concerned decline to try it out! For decades Berkeley has focused on a bike blvd-only strategy (there are no treatments of any kind whatsoever on almost any of its arterials). Today it has bike modeshare in the low-mid single digits. Davis now has a bike modeshare in the 20-25% range (this is for the entire city, not just students). Apples and oranges. The fastest vehicular cyclists still generally go much slower than motor traffic, certainly much, much slower than the type of drivers you’re describing who want to go 100+ mph all the time. To me it’s more a case of a double standard. We might design a street for motor vehicles to go 30 mph, then we design so cyclists can only go 12 mph of the part of the street designed for them. 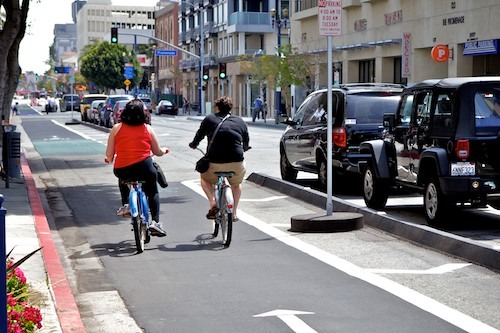 If we want to avoid public relations disasters like having VCs ride in the street when there’s parallel bike infrastructure, then that infrastructure should be designed to be used at up the same speed as the parallel motor traffic lanes. A secondary issue is it’s not that much harder to design infrastructure which is satisfactory to most VCs compared to substandard infrastructure. Often the only differences might be barriers to prevent pedestrians from walking in the bike lane and the avoidance of tight turns. In other cases you might need to make the path a bit wider to allow safe passing. So, no, vehicular cyclists don’t have an absolute right to cycle faster than 99% of other cyclists, and demand also that road traffic let them have priority anywhere. Actually, cyclists of any speed should have priority over motor traffic. It’s much easier for a motor vehicle to get going again than it is for a cyclist. Yep, that’s a problem I’m very familiar with. 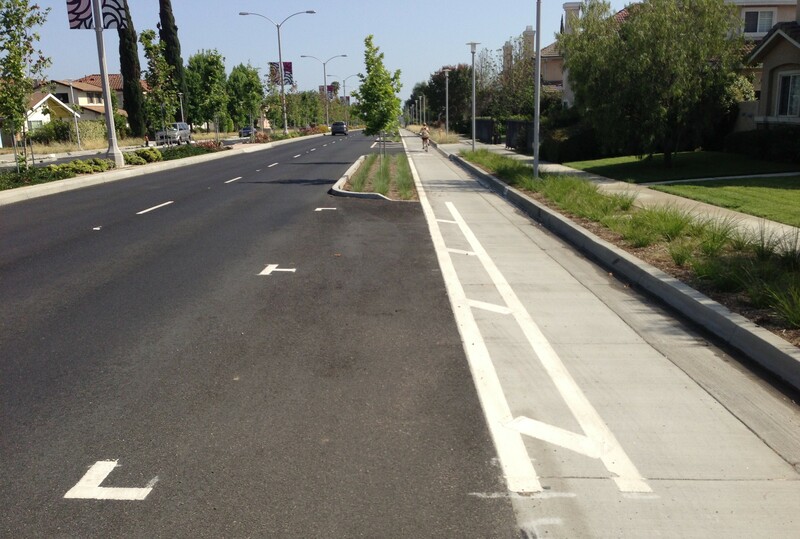 Here in SoCal, we might get a stripe of paint next to a 6-lane arterial. Needless to say, no kids can be seen there and even almost all the adults are on the sidewalk. Even in new projects. These places are prime examples of where a protected bikeway would be an ideal treatment, especially with the purer adherence to corridor access management, which keeps potential “conflicts” to a minimum and controlled. But even many of the older ones have plenty of space to also do bikeways properly. That’s the message here: there’s space and an ideal situation, so let’s get this done. Wait, so what happens when you have a VC doing 25mph in the same bike lane as the much greater number of grannies and duffers doing 10mph…? Are you advocating multiple bike lanes (I think it’d be great but probably not happening anytime soon)? Gezellig answered my question but the bottom line is any decent bike infrastructure should have room for safe passing. All cyclists ride at different speeds. I don’t think a 13 mph cyclist wants to be stuck behind a granny going 8 mph any more than a VC wants to be stuck behind that 13 mph cyclist. In truth, the differential in bike speeds from fastest to slowest is small enough that all you need to accommodate it is room for safe passing. It’s not like you’ll ever have someone going 50 mph passing someone going 8 mph. On another note, if/when velomobiles become much more popular, and depending upon what speeds they’re capable of, you may indeed in the future want something separate for them (or maybe not if they can keep up with motor traffic). That said, I’ll note that velomobiles seem to have no issues on Dutch bike paths, even when ridden at 60+ kph. So long as there’s room for safe passing, and good lines of sight so you can see people you’re coming up on well in advance, I think we can even accommodate velomobile speeds without any major issues (except maybe on some very crowded urban paths). Yikes. That is some tight passing, especially with mopeds sharing the path. This is what I should be looking forward to? I would definitely be taking the road instead of risking these situations. Mopeds sharing the path is one area in which I strongly disagree with Dutch policy–it can create a fair number of problems such as that (it’s been debated off and on for years in the NL). There is actually a fairly complex set of rules there about when mopeds are required/optional/not allowed on paths (there are also distinctions between mopeds of small engine size vs. larger ones). 1) Shared bicycle/moped paths are thankfully unlikely to happen in the US. 3) Personally, I’d rather negotiate space with other people on bicycles than people in trucks and speeding cars whose mass and possible inertia/speed far exceed my own. 4) In practice, passing is usually a non-issue. Both because the paths are wide enough and people on bikes are far better at negotiating space with each other than cars are. In practice, it’s just not a big problem. Non-fatal injuries are also much higher in the US.